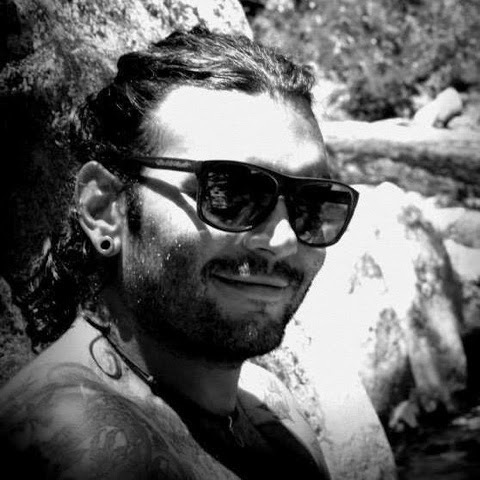 BEHIND THE LENS: DBP interviews Zé Assis | DBP MAGAZINE ONLINE The World's Best Free Whitewater Publication. 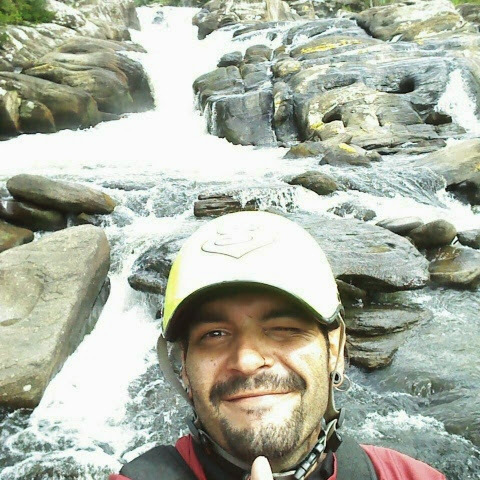 Zé is a professional photographer and whitewater paddler living and working in São Luíz do Paraitinga, Brasil. He is also a DBP Admin for our Facebook page. We asked him to share a few of his favorite pictures and tell us a bit about Dirtbagging in South America. 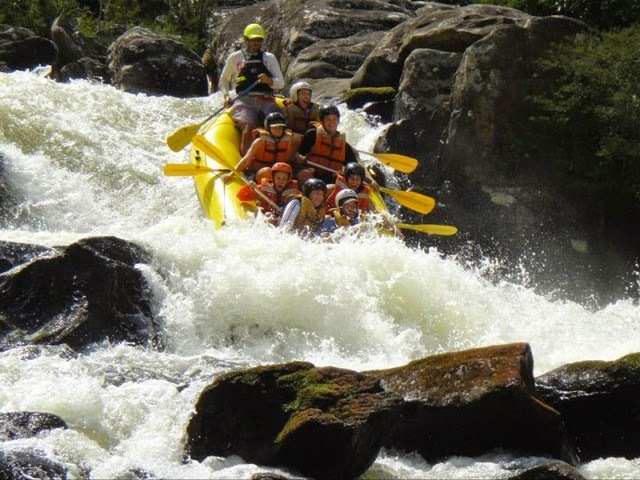 DBP: It all starts behind the lens when talking great whitewater photography. What goes into the planning before you head out on a trip? What do you look for in terms of selecting a location? ZÉ: When looking for a new river I first plan the mileage, then sort out food and camping equipment. I always worry about batteries for the cameras too. We also plan clear exit strategies in case of emergencies. DBP: The camera is a crucial piece of your gear, and there are so many good models available today for shooting in risky, changing environments like The River. Tell us what your favorite camera is? 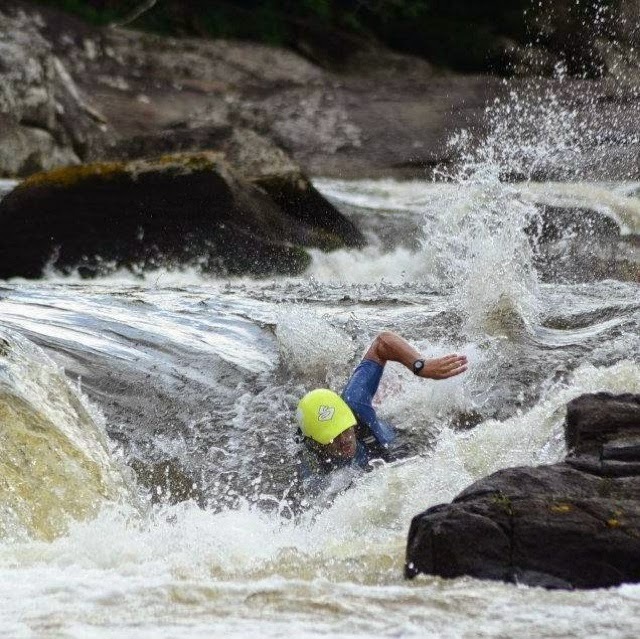 Any tips for the aspiring whitewater photographer? ZÉ: I have a Canon T5i: fast, lightweight and practical; but I really like the Canon 5D. I think its perfect for the job for fast paced, ever changing river shoots. My tip for anyone who is starting out in photography is to carefully choose the setting so one manages to capture and convey the right message. DBP: Of course you need to get yourself TO the spots you’ll be shooting. 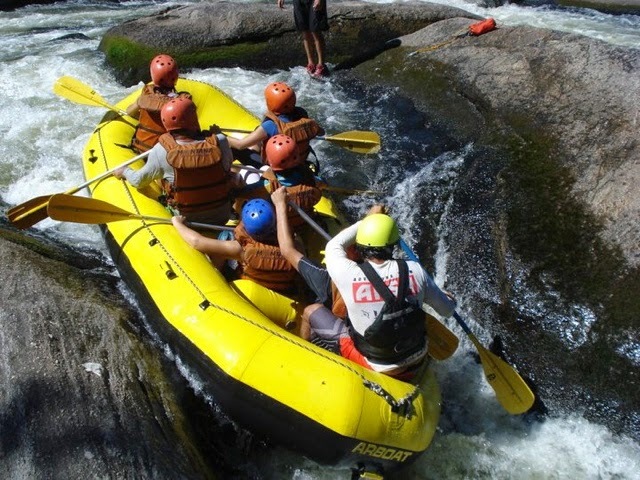 What’s your favorite boat to paddle? And what drybag or box do you use to transport your camera and gear, or do you use waterproof gear? ZÉ: I like the Dagger Nomad: fast and comfortable with plenty of room. I use a Watershed drybag to carry my camera. 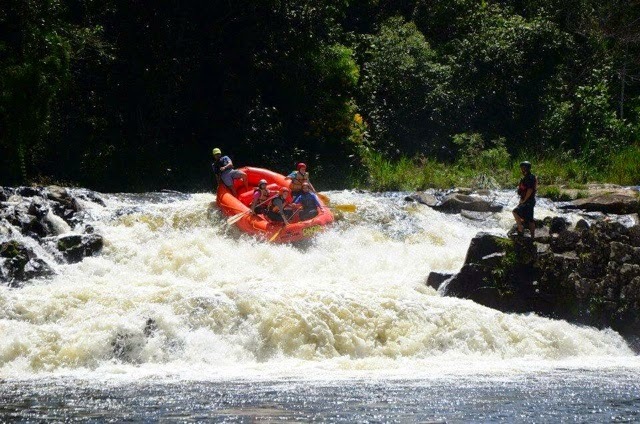 DBP: Do you prefer shooting raft trips for paying outfitter customers, or shooting private trips? ZÉ: I like to photograph private trips where I can shoot even more photos. 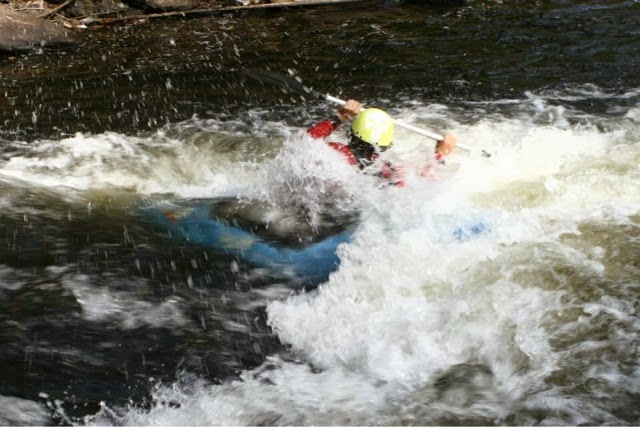 DBP: How long have you been paddling, and what is your favorite river? 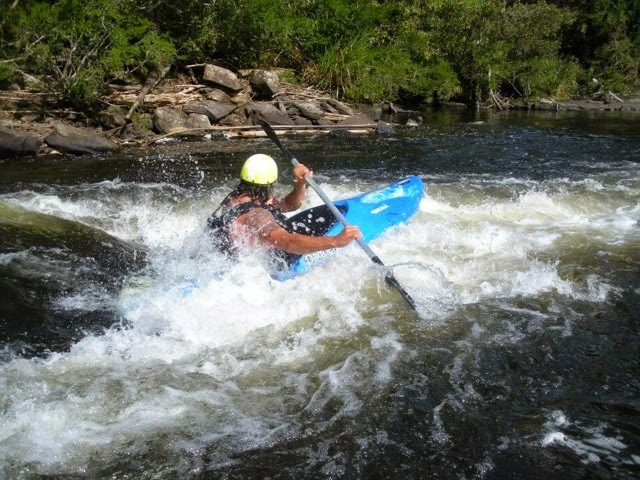 Where is the place you most would want to go paddle and shoot that you have not made it to yet? ZÉ: I’ve paddled, and been a photographer for 11. 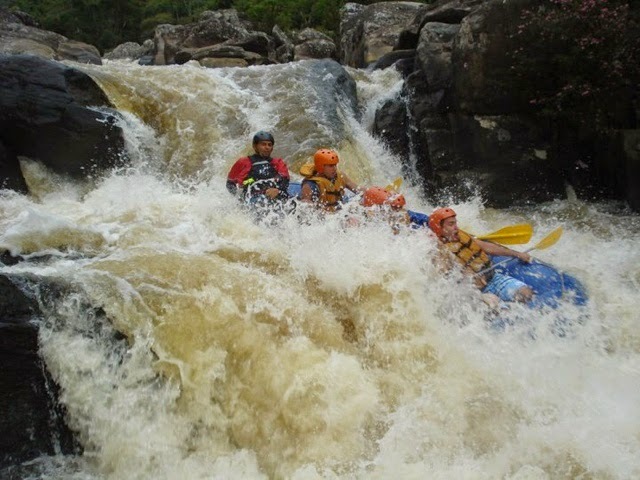 My favorite river is the Rio Paraibuna here where I live. I would like to shoot the southern rivers of Brasil, and travel to the Zambezi in Africa. DBP: Tell us about your biggest WALLACE. How did it happen? Did you lose any gear? 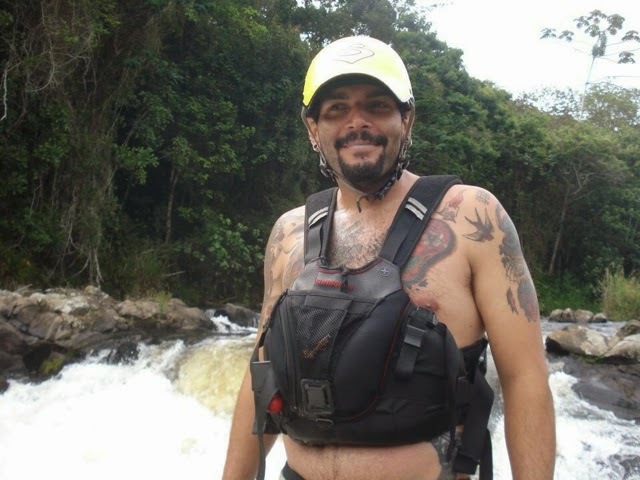 ZÉ: My biggest WALLACE was here on the Paraibuna in the park stretch where a boat flipped over my kayak. I had to eject but didn’t lose my camera. I didn’t get a photo because I was the photographer! DBP: What is your most favorite picture you’ve ever taken? Did you plan a lot for it to happen, or was it just a magical spur of the moment shot? ZÉ: I did not plan my favorite photo, but from the beginning I saw the boat coming straight for me. I thought it would flip, but it yielded a beautiful image. DBP: We’ve seen the picture of the throwbag being tossed to the rafters, which appears to have a carabiner attached to it… Can you tell us what’s happening in this picture? ZÉ: Yes! 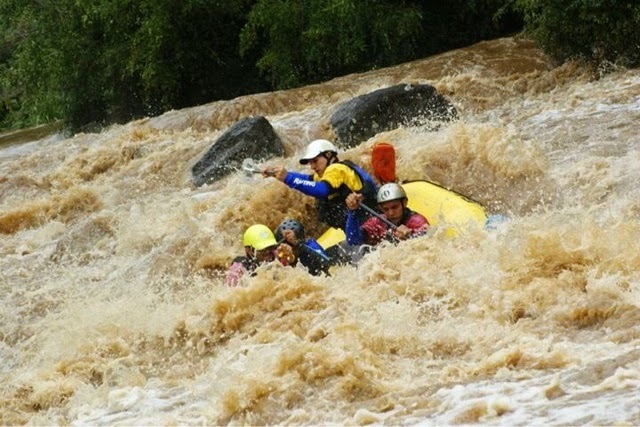 The boat is stuck in a Class 5 rapids just above a very big drop! It’s impossible to come down, so we tossed them a rope to clip on to pull them out. 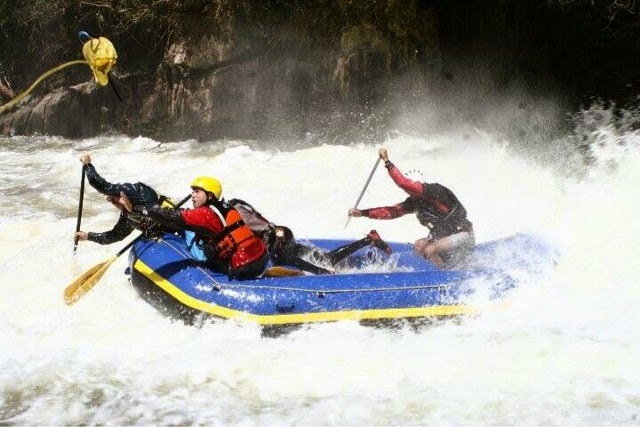 DBP: Have you ever been on a trip where you had to set down the camera to assist in a rescue? ZÉ: Already twice I’ve had to drop the camera to assist in a rescue. Here in Sao Luis do Paraitinga on the first of January 2010 the river that runs through town overflowed and rose 14 meters above normal, flooding 70% of the city. 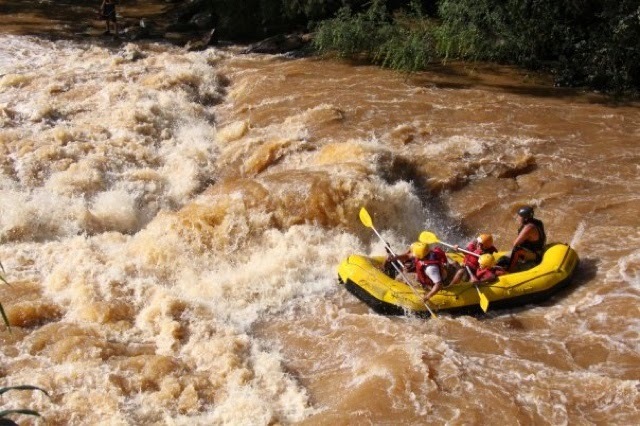 Raft guides and kayakers spent 36 hours rescuing residents! It went perfectly with zero fatalities. 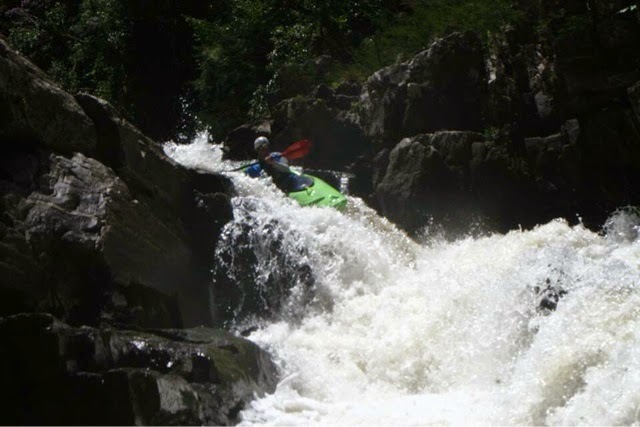 DBP: Many dirtbags from all over the world will read this article, and most of us will never have the opportunity to paddle far from our home rivers, or the privilege to paddle in your country. 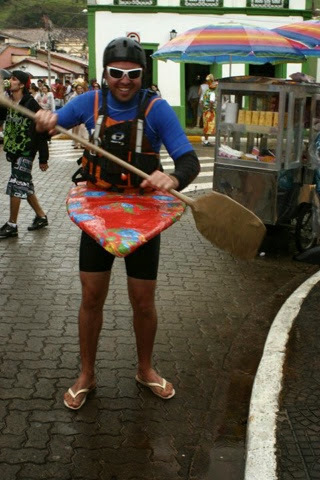 Can you briefly describe for us what the rivers of Brasil are like , and what it is like to be a part of the paddling community there? Is it close knit or competitive? ZÉ: I know few rivers outside Brazil, Chile and Argentina. 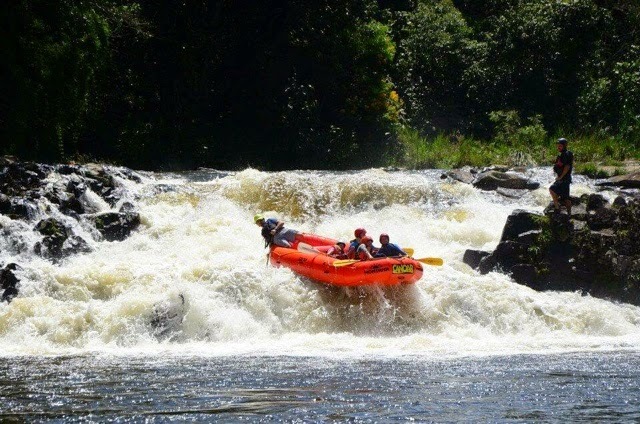 The rivers of Brazil have tons of variety, from large waterfalls to good commercial rivers. 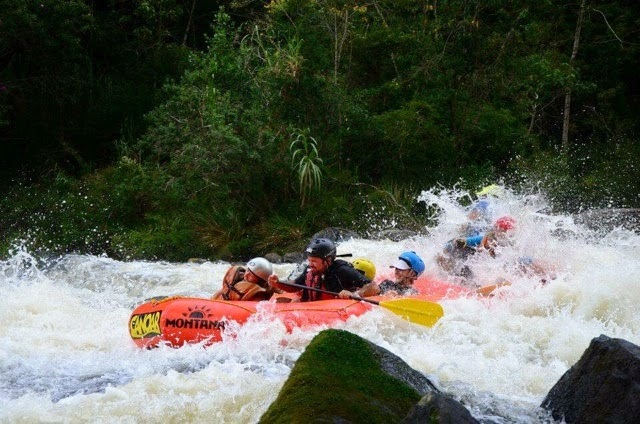 I see a very united paddling community, but there are always major disputes between the outfitters kkkk!! DBP: Let’s say today is “THE Day”… You’ve got unlimited funds, and you can pick any partners in the world to run a mission for pure fun. Who are you taking, and where are you going to? ZÉ: Evan Garcia, and we are going to Mexico! DBP: Thanks so much for your time and sharing these great pictures, Zé! One last question, knowing that in South America it is your summer time (while here in North America many of us boaters have traded paddles for skis or snowboards), what is in store for you in 2015… Any big plans? 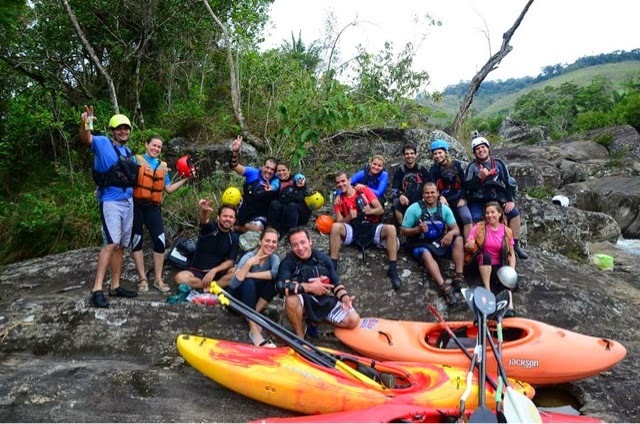 ZÉ: My biggest plan for 2015 and beyond is make beautiful pictures for my new company, and conquer my own kayaking! Como vc se planeja antes de sair tra viagem? Nos conte qual sua câmera favorita? DBP: claro q vc tem q ir pros lugares q vc vai tirar as fotos. Qual o melhor bote ta remar? Pra transportar sua câmera e o resto? Ou vc sua algo a prova d'água pra transportar? * ou vc usa algo a prova d'água pra transportar a câmera? DBP: vc prefere tirar fotos em viagemns para clientes pagantes ou viagens privadas? DBP: há qto tempo vc rema? E qual seu rio preferido? 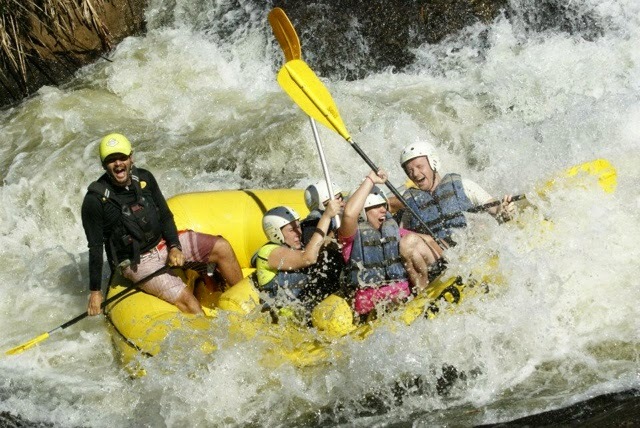 Gostaria de ir remar e tirar foto mas q ainda não foi? o q aconteceu? Vc perdeu algum equipamento!? e não perdi a câmera pq eu era o fotógrafo! DBP: qual a foto favorita q vc já tirou? Vc planejou Mto pra tirá-la ou foi uma mágica no momento de tirar a foto? Parece q tem um mosquetao ligado a isso. Vc pode nos falar sobre isso? DBP: vc alguma vez já esteve numa situação q teve q desligar a câmera pra ajudar em alguma emergência? E como eh fazer parte da comunidade de remadores? DiZer q hj é " o dia"
Onde iria e quem escolheria? Evan Garcia e estamos indo pro México! Quais são seus planos p 2015?